Somehow this came across my mind today. I would just like to say for the record. Jim, this comic, The Mighty Thor #380, is quite possible one of the best comics ever created. You see, only recently did I find out that Jormundgand is the middle child of the god Loki. According myth, Odin tossed Jormundgand into the great ocean that encircles Midgard. Jormundgand, the serpent, grew so big that he was able to surround the Earth and grasp his own tail. When he lets go the world will end. Jormundgand's arch enemy is the god Thor. In the end Thor kills Jormundgand and in doing so, destroys the world. In the comic, each page is a splash page and Thor doesn't speak, only Jormundgand does. At then end Thor does destroy him and there is nothing left. When you are 10 years old and you pick up a comic at 7-11 of the rotating rack you do so for a number of reasons, none of those reasons are for the story of Jormundgan. What a nice treat to come across this today. 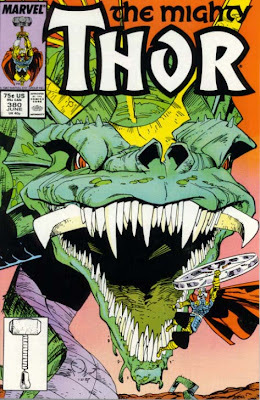 Anyway... Walter Simonsons run on The Mighty Thor is probably one of the best in comics history. Jim; watch out next time I'm home, his issues may come up missing. Obviously, you must have already pilfered my #380. I'll take it back, please. Also, one of the reason's this 10 year old (or was it 8?) started reading Thor was because his older brother by 2 years handed him Thor #367 off the 7-11 rack and said "I read Spider-man, therefore you must read something else". (Or something like that). 23 years later, sadly, I bought 2 Thor collections last month (after not reading any comic books for years.) Thanks, bro. By the way, the 2 new collections were written by Michael Stracynski (The Changeling and Babylon 5). Very good, reminding me of Simonson a little.